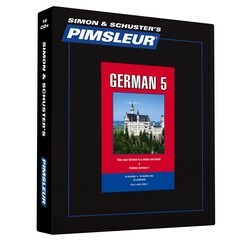 German Level 5 is designed to be taken after Pimsleur’s German Level 4. Thirty 30-minute lessons totaling 15 hours of spoken German language learning, plus one hour and 15 minutes of reading practice. 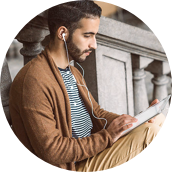 German Level 5 builds upon skills taught in Pimsleur’s German Levels 1-4. You’ll be speaking and understanding German with near fluency and with a broad range of conversational skills. In Level 5 the pace and conversation moves quite rapidly, accelerating exposure to new vocabulary and structures, approaching native speed and comprehension. You’ll learn to speak more in-depth about your personal life and emotional state, and be able to create complex sentences using a mix of tenses and moods. After Lesson 30, a short story broken down into 20 manageable segments (over one hour and 15 minutes) is provided for practice reading German.